Why are nails part of the integumentary system? Nails, which are modifications of the epidermis, are protective coverings on the ends of the fingers and toes. 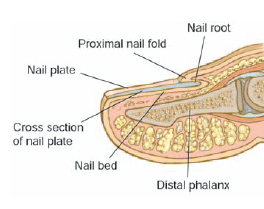 Each nail consists of a nail plate that overlies a surface of skin called the nail bed. The whitish, thickened, half-moon shaped region (lunula) at the base of the nail plate is the most actively growing region. Nails, like hair, are primarily dead keratinized cells.